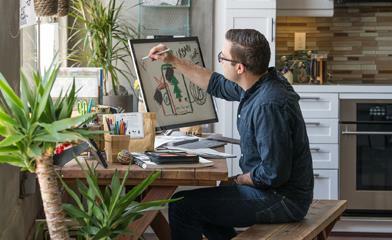 Learning Tools for OneNote has new features and is now generally available in English. For more details read this blog post. Today’s classrooms include students with a wide range of abilities. Educators are expected to adapt content to meet the needs of each of their students, including students with learning differences. While technology can be an enabler to learning, for some, technology is a challenge. Many educators lose valuable instructional time discovering, justifying, deploying and maintaining assistive technology for students with learning differences. To help address these challenges, we’re introducing Learning Tools for OneNote. A Microsoft hackathon winner, Learning Tools for OneNote is a toolbar add-in for OneNote 2013 and 2016, which improves reading and writing experiences for all students—including for students with learning differences like dyslexia. Let’s take a look at what is possible with this simple but powerful tool. The OneNote Learning Tools toolbar add-in. 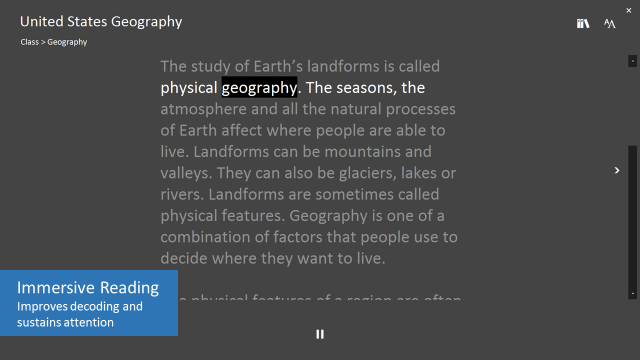 The OneNote Learning Tools Immersive Reader uses simultaneous highlighting and voicing text, allowing users to improve focus and reading speed. Enhanced dictation Improves authoring text. Focus mode Sustains attention and improves reading speed. Immersive reading Improves comprehension and sustains attention. Parts of speech Supports instruction and improves writing quality. Comprehension mode Improves comprehension by an average of 10 percent. We’ve also created a OneNote Learning Tools FAQ to help get you up and running with this new tool. This is just the beginning of our work in creating a more inclusive classroom with our tools. The challenges that come with language and literacy barriers are vast and varied, but technology can help students overcome these obstacles and become more independent in class. Just one example is the ability to quickly capture content from a worksheet, handout or other text using Office Lens to take a picture. After snapping the photo, you can send the content directly to OneNote. Office Lens recognizes the text via Optical Character Recognition (OCR) and also provides ALT text to the OneNote page. The Learning Tools Immersive Reader can be used on the captured photo to quickly read back the text using the text-to-voice technology, and the other Parts of Speech features can be used on the text from the photo. Using Office Lens to send captured content directly to OneNote and use with the Learning Tools. Aligned with the Microsoft mission to empower every person and every organization on the planet to achieve more, we are investing in bringing the OneNote Learning Tools and other accessibility features not just to OneNote but across Windows and Office 365. You can learn more about this in the new Accessibility Guide for Educators.